Orders placed are limit orders in the marketplace visible to other internal participants, and necessitate the required margin as soon as they are created. The order placed is the only one able to capture potential market orders sent by other internal participants to the marketplace. BID and OFFER orders are limit orders, visible in the market depth by other internal participants in the marketplace. To the extent of the internal liquidity, these orders have the ability to capture the internal market orders and therefore to enable the clients to perform their own market-making activity. Bid and offer orders can be used to take, flatten, reduce or increase an exposure. BID and OFFER orders are visible in the market depth only for amounts from 100 000 units for currencies, 10 Oz for gold, 500 Oz for silver and 1 contract for other instruments. Smaller orders are not visible in the market depth. The execution method remains the same for all size orders.. 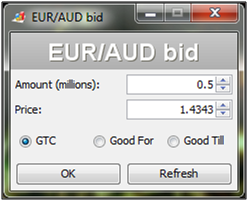 Amount: The amount of the bid, or offer, defined by the trader. The default amount as well as the unit are defined by the preferences and can be modified at order edition. Price: The limit at which the order will be placed. It shows by default the current best bid market price for a bid order, and the current best ask market price for an offer order. Expiration: The expiration date of the order, defined by the trader either as, good-till-canceled, valid for some time, or valid till a specific date in the future. 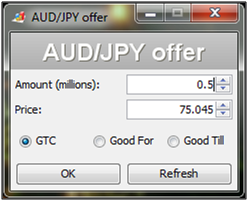 The GTC option is selected by default. If the Good For is selected, the default is for 1 minute. If the Good Till option is selected, the default is the current date + 1 minute. At expiration time, the order is canceled automatically. If the Good Till option is selected, and a past date is entered, the order will be immediately canceled when submitted. The Place BID and/or place OFFER command is available on the basic and full trading pane. A pop-up window is launched by clicking on the command button. The pop-up window shows the instrument and the side of the order. The order is submitted by clicking the OK button. Bid and offers are placed in the market depth and are visible by the internal marketplace participants. As they are limit orders, they cannot suffer negative slippage. If executed, it can be only at their limit prices, or better. Bids are usually executed fully, or partially, when the market ask level reaches the limit price of the bid order. Offers are usually executed fully, or partially, when the market bid level reaches the limit price of the order. However, bids and offers are able to catch market orders from internal marketplace participants. If a bid is placed with a limit above the current ask market price, it may be immediately executed. If an offer is placed below with a limit below the current bid market rice, it may be immediately executed. 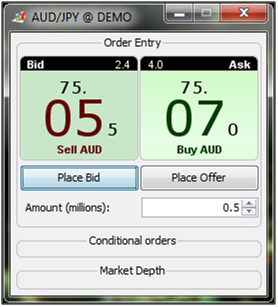 The required margin for bid and offer orders is calculated and reserved at order creation already. Therefore, the required margin is necessary to place bid and/or offer orders. If there is not enough margin the trader is prevented from placing bid and/or offers. In case bid and/or offers are placed already, and the free trading line shrinks in the meantime, these orders are canceled automatically when the required margin for their maintenance has vanished. The time validity of the bid and offers orders can be defined by the trader. Depending on the option selected, the order is canceled automatically once the validity expires. The time zone applicable to date and time definition is the GMT time. Clients should be aware of the time difference between the GMT time and their respective time zone. Bid/Offer orders can be good till canceled orders, this is the default expiration option. The mention GTC is dispatched in the column Expiration of the orders pane. Refreshing shows the current market bid or ask price depending on the side of the order. 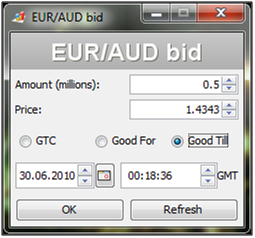 Bid/Offer orders can be good for a duration defined by the trader, either in number of minutes, or number of hours. The effective expiration date is dispatched in the column Expiration of the orders pane. 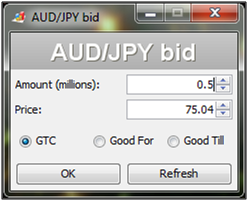 Bid/Offer orders can be set as good until a date in the future defined by the trader with a precision of a second. The effective expiration date is dispatched in the column Expiration of the orders pane. The time disclosed by default is the current time. Refreshing shows the current market bid or ask price depending on the side of the order and the current date and time.